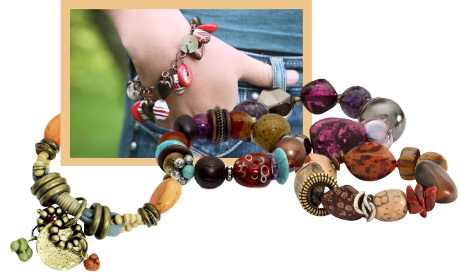 Chunky Bracelets Have Made a Comeback! Whoooeee! the curtain's opened once again on chunky bracelets in-trend with this year's emphasis on large statement necklaces and dangly earrings. Once again, because big bracelets have probably been around forever. The ancient Egyptians were creating hefty gold armbands encrusted with jewels and incised with spiritual imagery about the same time that Chinese artisans were carving bracelets from substantial pieces of jade. And I think I've been a fan for that long. But today's costume jewelry is lighter, brighter, more colourful and waaaaay more accessible to a fashionista like yourself. A chunky bracelet really gives you bang for your buck. And there's so many reason to buy a big beautiful bracelet. First - they simply dangle from your wrist so really aren't overpowering like a statement necklace might be. A bracelet leaves room for you to say other things about yourself other than "Hey, look at my face!" Second - a bracelet speaks of things feminine. Know why? Bracelets move. They slip subtly up and down your arm . . . caress is the word I'm looking for. And some bracelets jiggle. That's the thing about women . . . we jiggle . . .and there's something in favour of a piece of jewelry that emphasizes that. Third - They're fun. Of course they're fun! No one wears a bracelet to show how serious they are about the condition of the world! A few words about bangles. They've been around forever and you need some. Did you know that the concept of wearing a multitude of varying width bracelets has its origins in areas of the world dominated by men? Although they held title to little else, women did own their jewelry. No matter how narrow it was, a bracelet crafted in gold represented security to a woman who had few other legal rights and no other liquid assets. You on the other hand know where your next meal is coming from and are probably not entirely dependent on a male member of our species. So your bracelets don't have to be real gold (though that would be nice), they just have to be pretty and emphasize your feminine wiles. And they're so versatile! Wear one or two to the office because that's not the place to flaunt your jiggly bits, but as you leave your desk at the end of the day slip the rest onto your arm and party! And now a few words about size. The fact is that I don't know what size bracelet a customer might wear. Yet to stay in business I have to provide her with something that fits. With years of experience as a costume jewelry retailer I've learned that the easiest way for me to help folks find a bracelet is to only sell "one-size-fits-all" varieties. So in my store I sell stretchy and memory wire bracelets. That works for me and the customer is always happy. 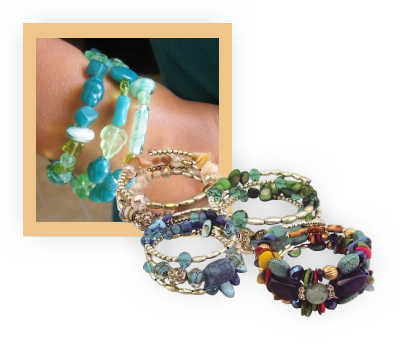 Shop for memory wire or stretchy bracelets here. Or read about the scarf jewelry that we carry in the store.